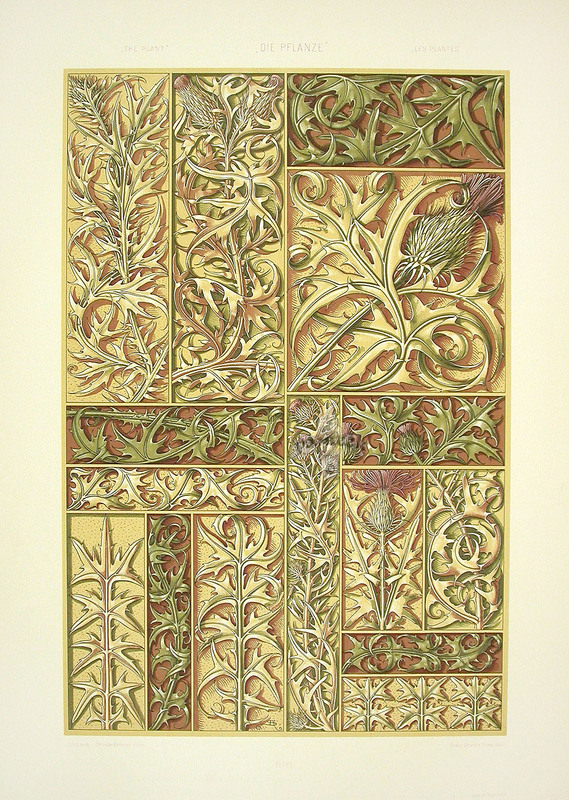 Each chromolithographed print measures approximately 14 3/4 by 21 inches. We are delighted to offer a superb selection of prints from Anton Seder’s The Plant in Art and Trade, published in 1890 by Gerlach & Schenk, in Vienna. This work is one of the seminal influences in the Art Nouveau movement. Many of the designs were by the master himself, the great Anton Seder, and show his hallmark intertwined AS signature in varying forms, from prominent to almost undetectable. Other artists for the work include Birkenger, E. Unger, Franz Patek, H. Kaufman & E. Klimt. Seder was a German artist who became the first director of the newly formed Decorative Arts College in Strasbourg, in Alasace Lorraine. This area of the world was hotly contested by both the French and the Germans, and became a unique marriage of cultures as it alternated between the two countries. The College was an inspirational focus for the entire Art Nouveau movement, from the superbly decorative building housing it to the subjects taught there- Architecture, Painting, Sculpture, and the cabinet making and iron work that became so central to the new movement. The designs Seder produced for The Plant in Art and Trade are now icons of the era, still breathtaking in their beauty and originality. The colors are rich, often highlighted with genuine gold and silver illumination. Each chromolithographed print is very large, measuring approximately 14 3/4 inches wide by 21 inches long on high quality paper. The condition of the prints is very nice with only a little faint foxing on just a few of the plates. The prints are very decorative, and very scarce, hence a treasured addition the collection of the Art Nouveau enthusiast.